Samuel Hartman is a vegan athlete, activist, and writer living in Louisville, KY. He has written for VegNews and other publications, always trying to take a positive look at ways in which we can better ourselves through eating and living. When he's not doing vegan outreach, Sam enjoys playing music, having lengthy philosophical discussions, and cooking delicious meals for his friends. He blogs regularly at www.thenailthatsticksup.com. I became vegan after becoming interested in vegetarianism back in 2005. I had several vegetarian and vegan friends, who were never pushy, and at the same time, I was reading a lot about the health effects of red meat. I decided to try vegetarianism, more as a challenge than anything, and ended up sticking with it. I went vegan six months later, buying stuff like crazy to veganize my entire life (I now caution people not to move so quickly) and haven’t looked back since. Since January 1, 2006, so a little over six years as of this writing. Awareness, or “consciousness-raising” to borrow a phrase from Richard Dawkins. Of course, I discovered the horrors of factory farms, and the environmental toll of animal agriculture, but I never thought that I could be so passionate about a cause. I found that passion with veganism because of how easy it is to remove animal exploitation from our lives. I am proud to be living healthy and contributing to a more sustainable society, but overall I want to be known as a positive person and inspire others to act positively, be that veganism or any other cause. Veganism means the intention of eliminating the exploitation, or the use, of animals, worldwide, now, and forever. This is a never-ending goal, but one that with every meal and act we can move towards. Around the time I went vegetarian I got really interested in running and quickly became addicted. As many runners know, it’s easy to get caught up in your sport, the love of fitness, and not pay attention to your body. I did this, and succumbed to injury a year or two later. During this time, I learned more about weightlifting for strengthening purposes and also cycling as a way to get cardio without the stress on the joints. In cycling, I found a new love: road racing, and raced at an amateur level for three years in Louisville. The fitness, camaraderie, and culture of the sport are unmatched; it’s why the Tour de France is so glamorous and amazing. For road cycling, it’s pretty much a year-round pursuit with only a couple months off in September and October. From November to February, you build your endurance, and then intensity starts to rise, peaking around June or July, which is the height of the road season in the U.S. This year I’ve decided to focus more on weights, running, and try some new sports (rock climbing!) so I have a much more flexible training schedule. I typically work out five to seven times a week. I don’t, but if anyone wants to come to my gym or go on a ride with me, they are welcome to! Unless you have a strict pace you need to follow (be it intervals or a weightlifting circuit), it’s almost always more fun to have a friend to workout with. Some of my best rides and workouts have been my friends and I just goofing around, trying to see who could go faster or longer. I enjoy running and road cycling a lot, but I’ve also done a fair amount of mountain biking and what could be considered power lifting. I also enjoy yoga and rock climbing. I would assume the protein issue is still out there, but it’s fading fast with more and more people becoming interested in vegetarianism and veganism. It is so ridiculously easy to get enough protein. If people think vegans are ‘weak’ they’re typically just stating an insecurity they have about their cultural and habitual food choices: they’re nothing intrinsic about animal foods that makes us strong, at least in the 21st century. Even when I do eat “junk food” it’s typically cleaner than what my omnivorous counterparts are having. The big plus I see is that by not eating meat and dairy I’m fueling myself for training and for a healthy lifestyle years down the road. If you’re looking for protein in meat and eating lots of it, that’s not a recipe for living to 100+. It doesn’t correlate directly with veganism, but not drinking alcohol (I’m straight-edge) provides some benefits in the recovery/relaxation department. There have been times when I was skeptical of not taking in enough calories, but like any serious athlete, you have to make time for planning and cooking your meals. In the middle of the season I would typically eat 3,000-3,500 calories a day, but that wasn’t difficult if I made each meal a solid one with veggies, protein, grains, and so forth. 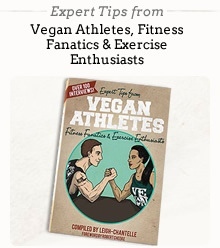 There aren’t any vegan cyclists around here, but there many online (veganfitness.net!) and around the world. In general cycling a sport dominated by culture and habit and that mostly comes from Europe where animal foods are widely eaten. That being said, American teams like Garmin-Cervelo have changed up their teams’ diets to include gluten-free stuff, and they have one of the sole vegan riders, Dave Zabriskie, on their team. I would say running or triathlons have it a little easier: there are quite a few vegans in those sports. Weightlifting has it the worst, of course, as it’s dominated by protein-obsession, which means meat-obsession. However, veganbodybuilding.com is doing its best to counteract that! Absolutely, and that’s always been a pretty awesome part of it all. My mom ended up going vegan a few years ago and my fiancée is slowly became vegan after seeing how easy it was to eat and cook vegan meals. I try to exude positivity and compassion and show people that eating vegan makes you happy and positive. Not only because of all the health/environmental/ethical benefits but because it allows you to see that change is possible! Most of my friends are pretty stoked on that aspect of me and know that veganism extremely important to me. It’s often not a question, but something along the lines of: “oh, that’s cool…I could never do that” or “yeah, I don’t eat much meat…but I could never give up my cheese.” Most people are interested but intimidated, specifically with regard to dairy because of how addictive it is. I try to tell them I went through all that, that I used to love meat and dairy, and that I was able to overcome all that and feel awesome because of it. There is lot of talking points out there, and it really just depends on the person I’m speaking to. If they love dogs or cats, that’s a great “in” right there. Any time I’m doing activism with a group and someone comes up to us with an open mind, it’s such a good feeling. It can take a long time to change your beliefs, your habits, but I’ve seen a lot of people do it, and that really drives me to continue being active. I’ve met so many people who were vegetarian or vegan and had no idea there were others out there who shared their beliefs. What motivates me is allowing my compassion to foster community in my city and spread across the world. If I can get people to realize that they are capable of profound change, then their actions will resonate with others, and the “love” will spread outwards. Breakfast - I used to be pretty obsessed with cereal for breakfast but I’ve tried to add in more protein, so lately it’s been black beans, onions, spinach, and perhaps some “chicken less” strips by any of the various brands. I also really enjoy a good tofu scramble with nutritional yeast. Lunch - My mid-day meals are so scattered that it’s usually just a lot of snacking until dinner. I love kale salads or any bean dish; homemade hummus is awesome of course. One thing I will never grow tired of is Tofurky sausages; so high in protein and so versatile in cooking. I eat a lot of “soy meat” or “wheat meat” but the taste and texture is what I want, not some carry-over of killing from my meat-eating days. Dinner - Dinner is usually my biggest meal of the day and while this is backwards to a lot of dietary advice, it works for me. I include all the macronutrients, though the carb ratio changes depending on what kind of training is going on, and use spices and sauces liberally. Stir-fries are my go to meal: a good protein source along with onions, broccoli, carrots, mushrooms, and some greens like Swiss chard. If I need carbs, I’ll go with brown rice or quinoa. There’s a lot you can do with squash, which is in season right now in the Midwest – I love sweet potatoes and spaghetti squash. I try to eat local when I can, though a cold frozen plain makes that difficult here! In general my food options are pretty diverse, but always vegan and always tasty. Snacks (healthy & not-so healthy) - Carrots and hummus are the ultimate healthy snack, I think. Nuts and seeds are great, and I usually rotate some sort of nut butter depending on my mood: peanut, almond, cashew. I really love the vegetarian jerky products, though those with the other soy meats can put you in the soy-overload category. When the country (U.S.) finally gets its act together and starts making a lot of hemp products I think that will be my go-to food; hemp is so healthy and nutrient dense it’s definitely worth eating a lot of. As for “vegan junk food,” I have no bounds…I love it all! Right now, I make Sundays my “cheat days” in which I eat anything and everything from vegan candy bars (Go Max Go!) to coconut ice cream and Tofutti Cuties. Anything by Sweet and Sarah or Liz Lovely is incredible and of course, I make my own brownies, cakes, cookies, etc. I cannot get enough of this stuff, which is why, for the moment; I restrict it to one day. The practicalities of a diet like this are mixed and I’d be happy to have a discussion with anyone about it. However, for me, it works. Protein - I think the best source is beans, at least the most natural. I love black beans and garbanzo beans like no other. The tastiest source is those Tofurky sausages – 27g of protein per sausage! Calcium - Calcium often appears in fortified soymilk or tofu now, but it’s also in the leafy greens I eat and nuts. I’ve had some nasty spills on the bike and zero broken bones, so I think they’re strong and healthy with the amount of calcium I take in on a normal vegan diet. Iron - I use a cast-iron pan for just about every stir-fry, mostly because of how easy it is to re-use and clean, but this does impart small amounts of iron into every meal. However, I get iron through nuts, soy products, beans, and some fortified stuff like cereal, too. My iron count at the blood bank has always been spot on. To really perform well I’ve found the best thing I can do is to eat a high-carb meal the night before. As far as direct food to energy connections, there are too many variables to really say. Mental preparation plays a huge part for sport, and if that gets messed up, it doesn’t matter how much energy, caffeine, sugar, or glucose you have in you. During races and around events I prefer easy sources of food like Clif bars or gels. Over the years I’ve tried all kinds of stuff, but two I really like are a solid multivitamin (Now brand, for instance) and a good probiotic for digestion and gas. Vegans eat a lot of gassy stuff and the probiotic, in my opinion, really helps with any stomach issues. For sport performance, I’ve tried everything from green tea to maca to CLA. Who knows if it works – the diet is the most critical component at the end of the day. Gaining muscle - Lift heavy, rest a lot, and lift again! Seriously, don’t spend two hours in the gym with 50 different lifts. Squats, deadlifts, and bench presses are (almost) all you need. Losing weight - Cut the carbs. I know, I know, but I’ve seen it work for me and so many others. Excess carbs get turned into fat, which, unless you are training 15 hours (or so) a week, mostly cardio, will just stay there. A “slow carb” diet of protein/veggies for six days and chaos on the seventh has worked for me. Maintaining weight - This one’s easy! Eat when you’re hungry, and exercise a few times a week to keep your body active. If you eat the right foods you’ll live quite a long time! Improving metabolism - Supposedly garlic, green tea, and a host of other supplements help with this, and you are welcome to try them, but I would recommend adding some weight routines into your work-out if you haven’t already done so. Most people focus on cardio so much; but everything will improve if you do some lifting. If you run for an hour, make it 45 minutes and do 15 minutes of work with free weights or a bar (squats, bench press) etc. Bigger muscles = more calories burnt, and your sport will improve because of it. Eat some protein in the morning, for breakfast, and don’t sit down all day. I’ve tried to convert a lot of my workspaces into standing desks for this very reason. It seems weird at first, but now I love it. Oh, and caffeine. Who can argue with a cup of coffee in the morning? Some, I’m sure. However, I love it, and there are health benefits too. Toning up - Again, this is a carbs thing; all of us have a ‘six pack’ buried under there somewhere, but burning calories only does so much. Especially for men, our fat likes to sit around our midsection, and I believe the best way to get at that is to stop fueling it with excess carbohydrates. Strength training will help, but up the protein and fat (with good stuff like olive oil!) and lower the carbs for a better effect. Every time I eat a vegan meal or question the societal norm of animal exploitation I promote veganism. The number one thing that I, or anyone can do, is live a good life. Strive to be positive, re-think negative actions, and act with compassion, not anger or violence. If people see vegans living well, then they will be interested in that, and seek out information. Find a local vegan or vegetarian advocacy group in your area, and if there isn’t one, start it! There are compassionate people everywhere, and the Internet is of course huge resource for this. Again, just living by example we can affect change, so don’t be afraid to live the way you want, and when people ask questions, tell them honestly why you’re doing what you do. If you hear about injustice to animals, speak up, but with kindness, not anger. Most people are simply unaware of the horrors that animals go through daily, whether for food, clothing, or entertainment. If we make them aware and offer alternatives, without forcing it, those with an open mind will seek to change.